PLEASE NOTE > All prices quoted are in euros. In parenthesis the venue and the city. Deep Puprle’s frontman Ian Gillan, has signed up to do a concert in Thessaloniki, Greece on Saturday, June 30 with the Thessaloniki State Symphony Orchestra. The venue is an open-air theatre called Theatro Gis. It seats 6,000 and is at a beautiful spot in the north part of the city. Ian will be singing to orchestral arrangements by Friedemann Riehle, the following Deep Purple songs: “Highway Star”, “Fireball”, “Smoke on the Water”, “Black Night”, “When a Blind Man Cries”, “Ted the Mechanic”, “Strange Kinda Woman” and “Perfect Strangers”. At the Theatre of the Earth (Theatro Gis), Damari Triandrias, Thessaloniki, tel 2310 288000. 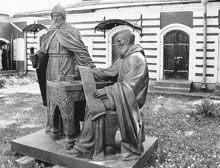 The statue commemorating the Leihoudis brothers in Moscow. The two men from Cephalonia founded Russia’s first University, the Slav-Greek-Latin Academy. Yesterday, in Moscow, just 200 meters from the Red Square, Greek President Karolos Papoulias unveiled a statue of the Leihoudis brothers from Cephalonia. Ioannis Leihoudis was born in Lixouri in 1633. Eighteen years later, his brother was born. The brothers went to Constantinople in 1683, and on the advice of four elders of the Patriarchate, set out on a journey to Moscow. The person who discovered the brother’s work is Dimitris Yialamas, Cultural Attache to the Greek Embassy in Moscow, President of the Department of Modern Greek and Byzantine Studies at Lomonosov University and Professor of Paleography. Yialamas talked to daily Kathimerini about his 23 years of research into the brothers. I started with the Russian State Archive of Old Documents. There is also archival material in Venice and Cephalonia, and many documents in St Petersburg, Ukraine, Greece, Denmark, Italy and France. I gradually began to piece together the story of these two unknown Greek teachers. How would they feel to see their statue being unveiled? They would be very moved because they arrived in Russia at the invitation of the Russian authorities, they worked, they gave a lot to Russian learning, Russian culture and the Russian Church, and they did not escape persecution. They were exiled to both Kostoma and to Novgorod, where they founded 30 Greek schools. Whose idea was the statue? The Greek Embassy, which got a response from Prime Minister Costas Karamanlis, who was Culture Minister at the time. During a visit to Moscow in 2004, he discussed the idea with Patriarch Alexius II and Mayor Yuri Luzkov, who support it. The Culture Ministry has said it will donate the statue to the people of Moscow. The Athens Concert Hall announces a rich and varied program for the 2007-2008 season > Class acts. The Netherlands Dance Theater is expected in Athens in March next year. Everything from exhibitions, showcases, the Princess Christine of Holland Awards, Chinese acrobats, George Dalaras and Agnes Baltsa concerts and a whole lot more seems to have a place in the Athens Concert Hall’s 2007-2008 season, according to the recent release of the program. In this, its 17th season, the Athens Concert Hall will host symphonic music orchestras, acclaimed interpreters from Greece and abroad, opera spanning all eras, such as Alexander von Zemlinsky’s «The Dwarf» and Arnold Schoenberg’s «Erwartung», epic productions that will be presented to the Greek public for the first time, such as Gioachino Rossini’s «L’italiana in Algeri,» directed by Jean-Pierre Ponnell and featuring Agnes Baltsa, piano festivals directed by Yiannis Vakarelis, dance festivals, 4th Balkan Dance Platform, the city of Berlin and art ensembles from every corner of the globe, as well as an acrobatic troupe from China. Greek music will also be present next season, with tributes and recitals scheduled for the Dimitris Mitropoulos Hall. In the Bridges series, which is managed by Dimitris Marangopoulos, Greek music will cross over with jazz. The section will feature three tributes: «Antonis Kaloyiannis – 40 Years» featuring Maria Farantouri and Georges Moustaki, a theatrical retrospective on the history of rebetiko music with George Dalaras and a tribute to Nikos Kypourgos. Dance aficionados are also in for a few treats, for apart from the Balkan Dance Platform, they will also be given the opportunity to see the work of Jan Fabre with the Nederlands Dans Theater. Young artists will get their day too, as the Rising Stars and Megaron for Youth series will feature new and award-winning artists, master classes with headline names and cut-price Sunday matinee concerts. The Great Orchestras series will feature the London Symphony, WDR Symphony, Royal Philharmonic of Stockholm, the Salzburg Camerata and the French Radio Philharmonic Orchestra, among others. Among the great interpreters invited to the Athens Concert Hall are classical pianists Alfred Brendel and Oleg Maisenberg, maestro Stephen Kovacevich and cellist Han-Na Chang. Another first this year will be a tribute to a European metropolis, and the city of Berlin will be represented through exhibitions and other events. The Tiger Lillies are back in town, bringing the air of a Brechtian Berlin cabaret to the capital’s Badminton Theater in the Military Park in Goudi in a run of shows until June 10. The cult British trio, who have played to packed houses in Greece in the past, have drawn their inspiration from Hans Christian Andersen’s “Little Match Girl” and the much-lauded sea. In the second part of the performance, Jacques explains, the trio has used songs taken mostly from their album “The Sea” and included the participation of Greek actor Yiannis Voglis reading extracts from Homer’s “Odyssey” as well as poems by Nikos Kavvadias and Samuel T. Coleridge. They will also be joined by acclaimed pianist and composer Hans-Joern Brandenburg and Vanessa Adam on the harp. Tickets are available at Virgin Megastores. For credit card reservations call 210 8840600 or log on to www.ticketnet.gr. Performances begin at 9.30 p.m.
Posted by grhomeboy in Hellenic Athens Festival. Under the baton of world distinguished maestro Yuri Temirkanov, the St Petersburg Philharmonic Orchestra will shine in a concert for a good cause. The orchestra, accompanied by Greek pianist Dimitris Sgouros, will perform at the Herod Atticus Theater next week, on Thursday, June 7. Proceeds from the concert will go to the Elpida Friends Association for Children with Cancer toward the construction of the first children’s oncology hospital in Greece. “Our cooperation with Elpida was inevitable,” said Giorgos Loukos, the artistic director of the Hellenic Festival, at a recent press conference. Loukos also spoke about the educational and social program that the festival has embarked upon, providing tickets to the Epidaurus Festival to students in Athens and Argolida as well as donating commemorative catalogs to school libraries all over the country, and holding performances in prisons. Dimitris Sgouros, who this year celebrates the 30th anniversary of his international career, has dedicated the concert to Elpida’s President Marianna Vardinoyianni as well as to the late great cellist Mstislav Rostropovich, who was his mentor as a child. The concert program will solely consist of works by Tchaikovsky, namely the Russian composer’s Piano Concerto No 1 in B Flat Minor and his Symphony No 5 in E Minor, Opus 64. Tickets are available for purchase at the Elpida offices, 10 Pindarou Street, Kolonaki, Athens, tel 210 7757153 and at the Hellenic Festival box office, 39 Panepistimiou Street, Athens, tel 210 9282900. Ticket prices range from 30 to 250 euros, depending on seating. Posted by grhomeboy in Arts Festivals, Stage & Theater. The National Theatre of Northern Greece holds the 1st Theatre Festival of South-Eastern Europe in Thessaloniki from June 14th to July 13th 2007. Following the success of the Artistic Managers Meeting with representatives of great theatre organizations around Europe, which was held upon the initiative of the NTNG in Thessaloniki in April 2006 and has paved the way for the development of communication and creative cooperation among the theatres of SE Europe, the 1st Festival of South East European Theatres is held this year focusing on ancient drama, under the title Ancient Drama Perspectives I. The ancient Greek drama with its universal character and range has opened a field of research, creative expression and fertile dialogue on political, social and existential issues for the countries of South Eastern Europe which have been severely tested in their recent history. Eight theatre organizations from eight countries are presenting performances of ancient Greek plays, as well as more modern ones inspired by myths that ancient drama employs, with the special participation of Katona Jozsef theatre of Hungary, that returns to Thessaloniki with a performance of Euripides Medea, directed by its artistic director, Gabor Zsambeki. At the Theatro Dassous (Forest Theatre of Thessaloniki), Dassos Seich Sou, tel 2130 288000.